← MIKE WATT: ON AND OFF BASS now distributed in Europe!! 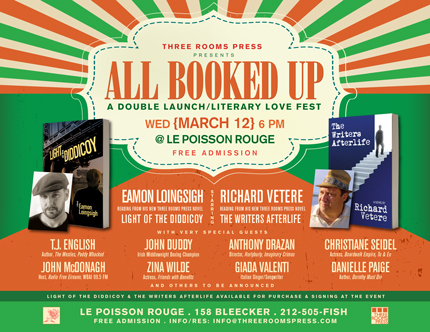 WEDNESDAY, MARCH 12, 6 P.M.
On Wednesday, March 12th, 6 p.m., Three Rooms Press presents the NYC launch for two new novels: THE WRITERS AFTERLIFE by Richard Vetere and LIGHT OF THE DIDDICOY by Eamon Loingsigh. The event will feature readings and signings by both authors plus readings and performances by special guests in support of the two novels. The new books will be available for purchase at the event. Three Rooms Press books are distributed by PGW/Perseus.